Both carriageways of the M6 were blocked in North Lancashire this afternoon after separate collisions in wintry weather. 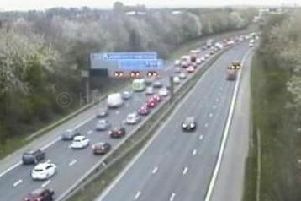 The northbound carriageway was shut around 3.10pm after a "serious" multi-vehicle crash near to junction 35 at Carnforth. And the road only reopened around six hours later as accident investigators examined the scene. A separate collision around the same time on the opposite side of the motorway also brought traffic to a standstill. But police were able to release traffic southbound once damaged vehicles were removed and an air ambulance, which landed on the carriageway, had left the scene. Vehicles on the northbound carriageway were being diverted around the incident via the A601(M) and the A6, to rejoin the motorway at junction 36. Drivers blocked in between junction 35 and the crash scene were urged to be patient, with police promising to release them as soon as possible. They began to free vehicles at the back of the queue at around 5pm and all the trapped traffic was released within three hours. At the time of the collisions the AA reported that the weather in the area was bad because of rain and sleet. In view of the deteriorating weather, a spokesman for Cumbria Police said: "Motorists are asked to drive with care on the approach to this area and to drive to the conditions they face." A spokesman for Lancashire Road Police urged drivers heading north on the M6 to avoid the area. At around 11pm the police tweeted: "The M6 north at junction 35 is now open, the casualty is in a serious condition and being cared for in hospital."